Burkholderia cenocepacia is a threatening nosocomial epidemic pathogen in patients with cystic fibrosis (CF) or a compromised immune system. Its high level of antibiotic resistance is an increasing concern in treatments against its infection. Strain B. cenocepacia J2315 is the most infectious isolate from CF patients. There is a strong demand to reconstruct a genome-scale metabolic network of B. cenocepacia J2315 to systematically analyze its metabolic capabilities and its virulence traits, and to search for potential clinical therapy targets. We reconstructed the genome-scale metabolic network of B. cenocepacia J2315. An iterative reconstruction process led to the establishment of a robust model, i KF1028, which accounts for 1,028 genes, 859 internal reactions, and 834 metabolites. The model i KF1028 captures important metabolic capabilities of B. cenocepacia J2315 with a particular focus on the biosyntheses of key metabolic virulence factors to assist in understanding the mechanism of disease infection and identifying potential drug targets. The model was tested through BIOLOG assays. Based on the model, the genome annotation of B. cenocepacia J2315 was refined and 24 genes were properly re-annotated. Gene and enzyme essentiality were analyzed to provide further insights into the genome function and architecture. A total of 45 essential enzymes were identified as potential therapeutic targets. As the first genome-scale metabolic network of B. cenocepacia J2315, i KF1028 allows a systematic study of the metabolic properties of B. cenocepacia and its key metabolic virulence factors affecting the CF community. The model can be used as a discovery tool to design novel drugs against diseases caused by this notorious pathogen. Burkholderia cenocepacia is a Gram-negative opportunistic pathogen and formerly Genomovar III of Burkholderia cepacia complex (Bcc). The Bcc comprises at least 17 taxonomically related species [1–3], which have developed diverse niches from the natural environment  and humans as they have emerged as pathogens in patients with cystic fibrosis (CF), chronic granulomatous disease, and in immunocompromised individuals . B. cenocepacia is the dominant Bcc species in patients with CF, accounting for between 50% and 80% of the infection cases . It also causes many instances of non-CF clinical infections, such as for cancer patients [6, 7]. As a representative isolate for the spread of an epidemic CF strain, B. cenocepacia J2315 belongs to a clonal lineage known as ET12, which is of increased transmissibility and dominates fatal infections among CF patients in the United Kingdom and Canada [8–12]. B. cenocepacia J2315 is notorious for its high resistance to the majority of clinically useful antimicrobial agents [6, 13], including antimicrobial peptides [14, 15]. Yet the mechanisms of host infection and drug resistance remain mostly unknown. The genome of B. cenocepacia J2315 has been sequenced and recently annotated . It is one of the largest Gram-negative genomes consisting of three circular chromosomes with 3.8, 3.2 and 0.8 million base pairs (Mb) respectively and a plasmid. Its complex genome encodes a broad range of metabolic capabilities, and numerous virulence and drug resistance functions that allow it to survive under a variety of conditions and invade immunocompromised individuals. It is vital to develop a systems-level metabolic model for this opportunistic human pathogen to explore and gain insights into its versatile metabolic capability and disease-causing mechanism, and eventually aid in finding potential clinical therapeutic targets. The genome-scale metabolic reconstruction enables integration of genomic information with metabolic activities observed in phenotypic experiments and other "omics" measurements to elicit hidden biological knowledge that would have been otherwise difficult to obtain. In this study, we presented the manually curated genome-scale metabolic network of B. cenocepacia J2315, named as i KF1028, which accounts for the major metabolic pathways for the synthesis of each component of biomass and for the degradation of common biologically important carbon sources. 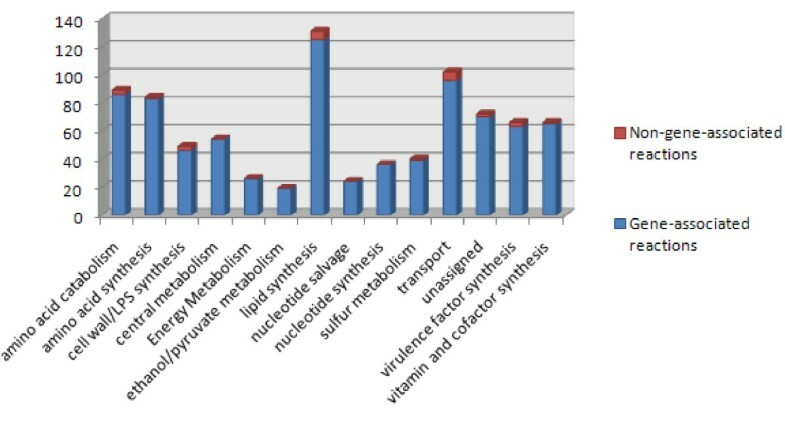 Syntheses pathways for key virulence factors highly associated with metabolism were particularly emphasized and reconstructed. The in silico model was validated by performing BIOLOG substrate utilization assays, which can test the ability of a microorganism to oxidize various substrates simultaneously . Model-driven analysis and discoveries, including refinement of gene annotation, and gene and enzyme essentiality, were carried out to define the architecture of the genome-wide metabolic and transport network and assist the identification of potential drug targets. Model i KF1028 provides researchers a framework to explore and understand the global metabolism of B. cenocepacia J2315 and its key metabolic virulence factors affecting CF patients upon infection. It allows a broad spectrum of basic and practical applications, especially the application for drug design which may open new doors for anti-infection strategies. Properties of metabolic reconstruction of B. cenocepacia J2315 (iKF1028) were compared with other published metabolic reconstructions of pathogenic microbes, S. aureus N315 (2009)  (which is the improvement of the N315 reconstruction by Becker and Palsson 2005 , and Heinermann et al. 2005 ), A. baumannii AYE (AbyMBEL891) (2010) , M. tuberculosis H37Rv (iNJ661) (2007) , S. typhimurium LT2 (iRR1083) (2009) , and P. aeruginosa PAO1 (iMO1056) (2008) . *: Not available for the reconstruction of S. aureus N315. Schematic representation of the metabolic network in B. cenocepacia J2315, referred as model i KF1028. Metabolic pathways included in i KF1028 and the distribution of gene-associated and non-gene-associated reactions for each pathway. The success of B. cenocepacia as a pathogen originates from the ability of its large genome to encode numerous virulence mechanisms , including quorum sensing (QS) [25–30], siderophores-based iron uptake systems [31–33], cable pili and adhesion [34–36], motility [37, 38], hemolysin , ZmpA and ZmpB proteases [40–42], phospholipases , secretion systems [44–46], lipopolysaccharides (LPS) [15, 47–49], and extracellular capsule . Syntheses of the key metabolic virulence factors of these virulent mechanisms, namely QS, LPS and rhamnolipids, were incorporated and analyzed in i KF1028. Table 2 lists the virulence-associated pathways and the required proteins and precursors for syntheses of virulence factors in each pathway. The LPS produced by B. cenocepacia J2315 has an important role in both disease aetiology and antibiotic resistance [51, 52]. LPS usually consists of three components: lipid A, core oligosaccharide, and O antigen. Although there were some studies on characterizing the features of LPS in B. cenocepacia, all these studies focused on a certain part/component of LPS. So far, there is no systematic elucidation of the LPS structure and composition specifically for B. cenocepacia strain J2315, nor any global analysis on its biosynthesis process of the LPS. In this study, we depicted the detailed features of the complete LPS structure in B. cenocepacia J2315 by integrating all available reports on LPS. 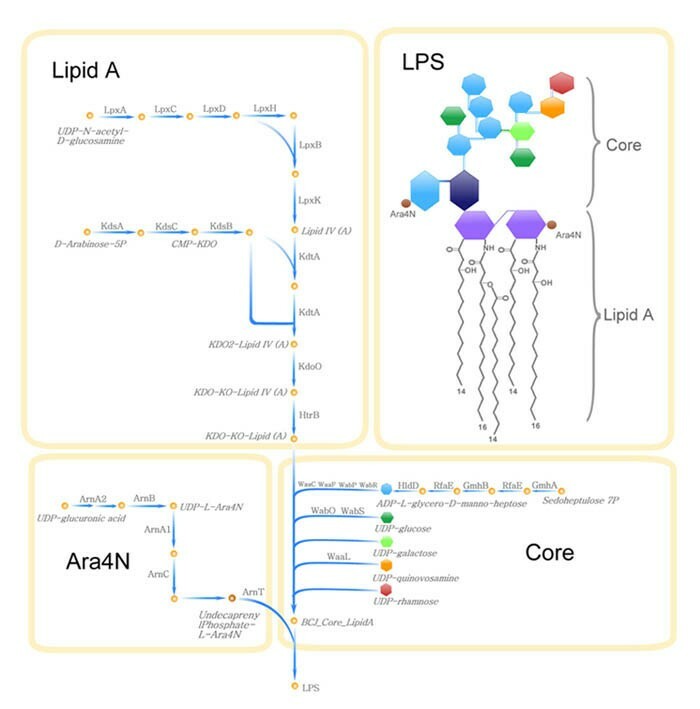 We also reconstructed the LPS-synthesis pathways supplemented with all necessary proteins involved and major metabolic precursors, as illustrated in Figure 3. According to our study, in J2315, each of the three components has a very unique feature. The lipid A portion is modified by an additional Ara4N residue [49, 53], which had been shown to reduce the binding of cationic antibiotics and was proposed as a potential drug target . The inner core oligosaccharide contains an unusual KDO-KO-Ara4N residue instead of the typical KDO-KDO residue [15, 51, 55]. The outer core comprises various polysaccharides including L-glycero-D-manno-heptose, glucose, galactose, quinovosamine, and rhamnose . The O-antigen portion of LPS in J2315 was interrupted by an insertion element in BCAL3125 [47, 56]. These differences might indicate the reason why strain J2315 is of remarkably distinct activity. Specific structure of Lipopolysaccharide (LPS) in B. cenocepacia J2315 and the synthesis pathways of LPS as well as the proteins involved. The lipid A portion of LPS is composed of two linked glucosamine residues (purple hexagon) with fatty acid side chains (wavy lines), (R)-3-hydroxyhexadecanoic (C16:0 (3-OH)) in an amide linkage and (R)-3-hydroxytetradecanoic (C14:0 (3-OH)) acid and tetradecanoic acid (C14:0) in an ester linkage. There are 4-amino-4-deoxyarabinose (Ara4N, brown sphere) moieties attached to the phosphate residues in the lipid A backbone. The inner core oligosaccharide contains unusual KDO-KO-Ara4N residue linked to the lipid A (KDO: 3-deoxy-D-manno-octulosonic acid, dark blue hexagon; KO: D-glycero-D-talo-octulosonic acid, light blue hexagon). Various polysaccharides comprise the outer core oligosaccharide (L-glycero-D-manno-heptose, blue heptagon; glucose, dark green hexagon; galactose, light green hexagon; quinovosamine, orange hexagon; rhamnose, red hexagon). J2315 cannot make complete LPS O-antigen, owing to an insertion element in BCAL3125 . B. cenocepacia strains possess multiple quorum sensing systems, which regulate the expression of versatile virulence determinants, such as biofilm formation and motility. Strain J2315 owns the ability to synthesize and recognize three types of chemical signals used for cell-to-cell communication: N-acylhomoserine lactones (AHLs), 4-quinolones (4Qs), and the DSF-like molecule cis-2-dodecenoic acid (BDSF). Two AHLs-based QS systems have been found in J2315, namely CciIR and CepIR [25, 57], which can both produce N-hexanoyl-L-homoserine lactone (C6-HSL) and N-octanoyl-L-homoserine lactone (C8-HSL) signals using acyl side chain (Hexanoyl-ACP and Octanoyl-ACP, respectively) and S-adenosyl-methionine (SAM) as precursors . The CepIR system is conserved in all species of the Bcc. The CciIR system is encoded within a pathogenicity island, designated as the B. cenocepacia island (cci), which was the first time that cell-signalling genes were found on a genomic island . The 4Qs-based signal, the 2-heptyl-4-quinolone (HHQ), is produced by B. cenocepacia strains . HHQ is the precursor of 2-heptyl-3-hydroxy-4-quinolone (PQS)  and its synthesis requires four proteins: PqsA, PqsB, PqsC, and PqsD. It had been reported that the exported HHQ from B. cenocepacia can be recognized by Pseudomonas aeruginosa within which HHQ is converted into PQS which is one of the QS signals for P. aeruginosa, highlighting the possibility of inter-species communication during the CF co-infection caused by P. aeruginosa and B. cenocepacia. BDSF is a newly discovered signal molecule produced by B. cenocepacia. The synthesis of BDSF requires the gene BCAM0581 . The synthesis pathway of rhamnolipids was also reconstructed in i KF1028. 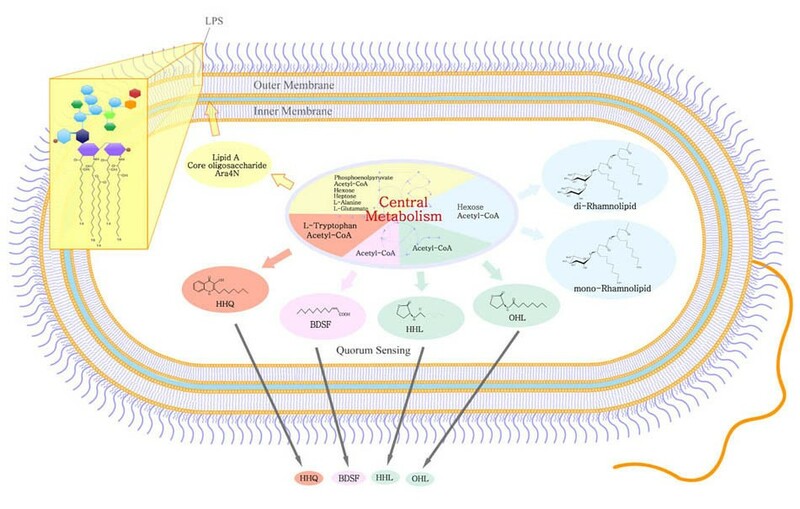 Although there has not been any report demonstrating that B. cenocepacia can produce rhamnolipid, Dubeau et al demonstrated that Burkholderia thailandensis has the orthologs of rhlA, rhlB, and rhlC, which are responsible for the biosynthesis of rhamnolipids in P. aeruginosa. By protein similarity search against the UniProt database, proteins coded by genes BCAM2340, BCAM2338, and BCAM2336 in B. cenocepacia J2315 were identified as highly similar in sequence to rhlA, rhlB, and rhlC in both B. thailandensis (with BLAST E value of 1E-121, 1E-173, and 1E-108, respectively) and P. aeruginosa (with BLAST E value of 3E-60, 7E-98, and 1E-67, respectively). This facilitates us to hypothesize that B. cenocepacia can potentially generate rhamnolipids. Further experimental investigations are needed. BIOLOG substrates utilization assays for B. cenocepacia J2315 were performed in triplicates in order to validate and refine the model. In silico growth on various substrates was simulated by setting each of them as sole carbon source and its uptake rate to 10 mmol/gcell/h under aerobic conditions based on M9 minimal medium. The simulation was performed on the ToBiN platform by flux balance analysis, as described in Methods. Of the 95 carbon sources tested, 40 could be directly compared with the in silico model of B. cenocepacia J2315, i KF1028. Preliminary disagreement between BIOLOG assays and in silico predictions were probably due to metabolic gaps, improper gene annotations and unacquainted transporters. These discrepancies were checked through gap analysis and literature mining. After continuous gap-filling and network refinement, the overall prediction accuracy was improved to 87.5%, a value that supported i KF1028 as being a proper reconstruction of the B. cenocepacia J2315 core metabolism (comparison results are showed in Table 3). Of the remaining 55 carbon sources tested, 14 were indirectly compared with the model due to the missing knowledge of whether the transport mechanisms of these compounds exist in J2315 or not. Initially, all those 14 carbon sources showed a no-growth phenotype both in silico and in the BIOLOG assays. Then we made the assumption that each of these carbon sources could be transported into the cell (i.e. to function as intracellular compounds) and re-tested whether the in silico model can grow on each of them. The results showed that 11 of the 14 carbon sources enabled i KF1028 to grow after applying the above assumption. This supports the hypothesis that J2315 lacks of transporters for all those 11 carbon sources, even though their catabolic pathways are complete. For the rest 3 carbon sources, the agreement between the in silico results and BIOLOG assays remained. The reconstruction of metabolic network allowed the identification and refinement of improperly annotated genes of B. cenocepacia J2315 from the public biological databases. Careful effort was made in this work to rectify the current genome annotation based on metabolic gap analysis, BLAST searches, BIOLOG substrate utilization assays, and literature mining. The full list of refinement of genome annotation derived from the genome-scale metabolic reconstruction is shown in Table 4. The first type of refinement was to re-annotate genes in i KF1028 - based on literature evidence and BLAST searches - that have been improperly annotated. An example is the gene BCAL1281, which was annotated in both the Burkholderia Genome Database and KEGG as a "hypothetical protein", but that was now reassigned coding for an "ornithine N-acyltransferase". It was reported that the outer membrane of "B. cepacia"  possesses unusual polar lipids, ornithine amide lipids (OL) [63, 64]. In addition, the protein OlsB is required for the first step of OL biosynthesis . By BLAST searches of OlsB against the UNIPROT database, the gene BCAL1281 of B. cenocepacia J2315 was identified with high similarity. Another type of annotation refinement was based on gap analyses, which pinpointed reactions for which the gene products involved were missing. For instance, we identified a missing reaction that should be catalyzed by IspE and that takes part in the biosynthesis of polyprenyl-PP, a necessary precursor of the ubiquinone biosynthesis. The IspE encoding genes for other strains of B. cenocepacia (AU1054, HI2424, MC0-3) could be identified in the Burkholderia Genome Database and KEGG. By querying GeneDB, we found that the genomic location from 872938 to 873820, named BCAL0802, was not assigned any function in the above two databases. A BLAST search of BCAL0802 against the UNIPROT database revealed a perfect match with IspE from other B. cenocepacia strains. Consequently, BCAL0802 is annotated as a 4-diphosphocytidyl-2-C-methyl-D-erythritol kinase and this missing reaction was supplemented into the model i KF1028. This example exemplifies how the reconstruction process can drive the reconciliation of isolated data from different biological databases. BIOLOG substrate utilization assays have already been successfully used on the refinement of metabolic reconstructions . It is an efficient approach for gap analysis and refinement of genome annotation. For example, in our study we can highlight the case for the substrate D-galactose, associated in BIOLOG assays with a growth phenotype. From that result we inferred that J2315 should contain a transport mechanism for D-galactose. By homology searches of MglA, MglB, and MglC, which are galactose-binding proteins conveying galactose into the cell, gene BCAL1431 (mglB), BCAL1432 (mglA), and BCAL1433 (mglC) were identified and they had been annotated as a putative sugar ABC transporter ATP-binding protein, a putative ribose ABC transport system, and a putative sugar transport system permease protein respectively. The ordering of mglB, mglA, and mglC is consistent with a) previous studies indicating that the mgl operon contains three genes and the genes are transcribed in the order of mglB, mglA, and mglC  and b) mglA and mglC being located downstream of mglB . As a result, the annotations of BCAL1431-1433 were refined to account for the galactose transport. In total, 7 genes were reannotated based on BIOLOG assays. The term 'essential gene' means a gene for which knockout is lethal (i.e. no biomass yield) under certain conditions (e.g. glucose minimal medium) . Identification of essential genes is helpful to understand the basic functions required for survival and it is an efficient way to discover novel targets for new antimicrobial therapies. Here in this study, i KF1028 was used as a framework to predict computationally identified essential genes in B. cenocepacia J2315 on both M9 minimal medium and synthetic CF medium (SCFM). About 19% (192) and 15% (154) of the 1,028 metabolic genes included in i KF1028 were predicted to be essential on M9 and SCFM media, respectively. There are more genes predicted as essentials on M9 than on SCFM, which indicates the influence of the living environment on the bacterium. 147 overlapping predictions were on both media. These essential genes are unequally located on the three chromosomes and most of the essential genes are located on chromosome 1 (Figure 4a). This result agrees with known features of the J2315 genome: chromosome 1 contains a higher proportion of coding sequence (CDS) involved in central metabolism and other house-keeping functions, whereas chromosomes 2 and 3 contain a greater proportion of CDS encoding accessory functions . Gene essentiality analysis. 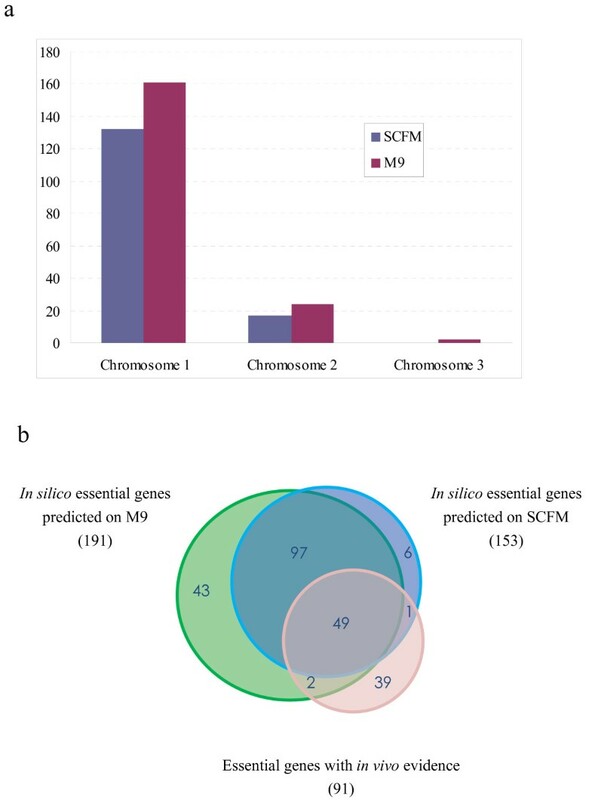 (a) Distribution of essential genes predicted on M9 and SCFM respecively; (b) Overlapping essentail genes among in silico prediction on M9, SCFM, and essential genes with in vivo evidence from two P. aeruginosa strains: P. aeruginosa PAO1 and P. aeruginosa PA14. To assess the predictive potential of the model, we compared the in silico essential genes predicted on SCFM with experimental essentiality data for P. aeruginosa PAO1 and P. aeruginosa PA14 [69, 70] since there is no experimental gene essentiality data available for B. cenocepacia. As both P. aeruginosa and B. cenocepacia are CF pathogens, and B. cenocepacia was historically classified under the genus Pseudomonas, it is possible that partial similarity exists between them. SCFM was chosen due to its similarity to the nutritional composition of sputum from CF patients. The common set of the essential genes from two P. aeruginosa strains was chosen for comparison in order to reduce the effect of strain-dependent variation. Totally, there are 294 in silico essential metabolic and non-metabolic genes of B. cenocepacia J2315 with high similarity to the common set of P. aeruginosa by BLAST searches, of which 91 in vivo essential genes are present in i KF1028. Genes in the in vivo essential set but not in the i KF1028 were assumed to be involved either in non-metabolic functions or in accessory functions of metabolism. A total of 55% (50) of the in silico predicted essential genes agreed with the in vivo essential genes based on gene homology with P. aeruginosa (Figure 4b, refer to Additional file 4 for detailed information about essential genes). Based on gene essentiality analysis, the genome-scale metabolic model of B. cenocepacia was further refined. For example, BCAL0660 and BCAL3421, which were homologous genes encoding protein AccC according to their annotation, were originally both included in the model with the gene-protein-reaction (GPR) relationship of "BCAL0660 or BCAL3421". Through in silico gene deletion study, BCAL3421 is identified as non-essential, which is inconsistent with the in vivo essential gene results. Such discrepancy was subject to further analysis. AccA, AccB, AccC, and AccD were four subunits of Acetyl-CoA Carboxylase (ACC) catalyzing the first step of fatty acid biosynthesis . The gene accB, of which the locus in J2315 is BCAL3420, is frequently adjacent to the gene accC and both genes are cotranscribed and form an operon together [73, 74]. Furthermore, BCAL3420 and BCAL3421 shows greater than 2-fold expression for J2315 under CF conditions versus soil conditions, yet BCAL0660 shows an opposite result . Taken together, BCAL0660 was excluded from model i KF1028. Further studies are necessary to validate the function of BCAL0660. Essential enzyme/protein refers to a gene product (catalyzing the relevant reactions) for which individual deletion (i.e. imposing the fluxes through these reactions to zero) is lethal under certain conditions. Through FBA using i KF1028,we could obtain a collection of essential enzymes (protein), based on which 45 essential enzymes were identified as potential drug targets and supported by experimental evidences from literatures. There are 39 of them which were also predicted as drug targets for P. aeruginosa PAO1 . All the 39 targets are nonhomologous to human protein sequences and thus could serve as potential candidate antibiotic drug targets for CF patients infected by both B. cenocepacia J2315 and P. aeruginosa PAO1. Among 39 targets, there are 9 targets, namely AccA, AccB, AccC, AccD, MurA, FolP, PhoA, RibE, and RibH, which have approved drugs in the DrugBank database . The other 6 potential targets, namely ArnT, ArnB, ArnC, ArnA1, ArnA2, and Ugd are unique in B. cenocepacia J2315. ArnT, ArnB, ArnC, ArnA1, and ArnA2 are necessary proteins required for the synthesis of Ara4N, which is an additional moiety of LPS specially presented in B. cenocepacia J2315. Ara4N is essential for the viability of B. cenocepacia J2315 and significantly contributes to high resistance to antimicrobial peptides (AMPs) . AMPs have been proposed as agents for treating CF infections [78, 79]. It had also been demonstrated that arnC transposon mutant was survival-defective and attenuated in infected rats . The UDP-glucose dehydrogenase (Ugd), which catalyzes the conversion of UDP-glucose to UDP-glucuronic acid and is the initial step in the synthesis of UDP-Ara4N, is also necessary for the viability of B. cenocepacia and its resistance to polymyxin B . These targets are potentially useful for designing strategies against B. cenocepacia J2315. Further studies are necessary to test their applicability. An overview of the 45 proposed targets is given in Table 5. # Essential enzymes unique for B. cenocepacia J2315 (others are shared between B. cenocepacia J2315 and P. aeruginosa PAO1). * The proteins have had approved drugs from the DrugBank database. In this study, we reconstructed the first manually curated genome-scale metabolic network of B. cenocepacia J2315, a Gram-negative pathogen for CF patients. An iterative reconstruction process led to the establishment of the model, termed i KF1028, which captures the important metabolic capabilities and biosynthesis of key metabolic virulence factors. The model i KF1028 shows its predictive potential when compared with BIOLOG assays. Model-driven analyses on gene annotation refinement and identification of gene and enzyme essentiality analyses are helpful to understand the genome and discover promising novel drug targets. Through careful investigation, we proposed 45 enzymes that catalyze reactions predicted to be essential for growth with priority to be considered as drug targets. The model will keep being further validated and improved with experimentally determined biomass composition, large-scale gene deletion experimental data, proteome, and metabolome data, as they become available for B. cenocepacia. 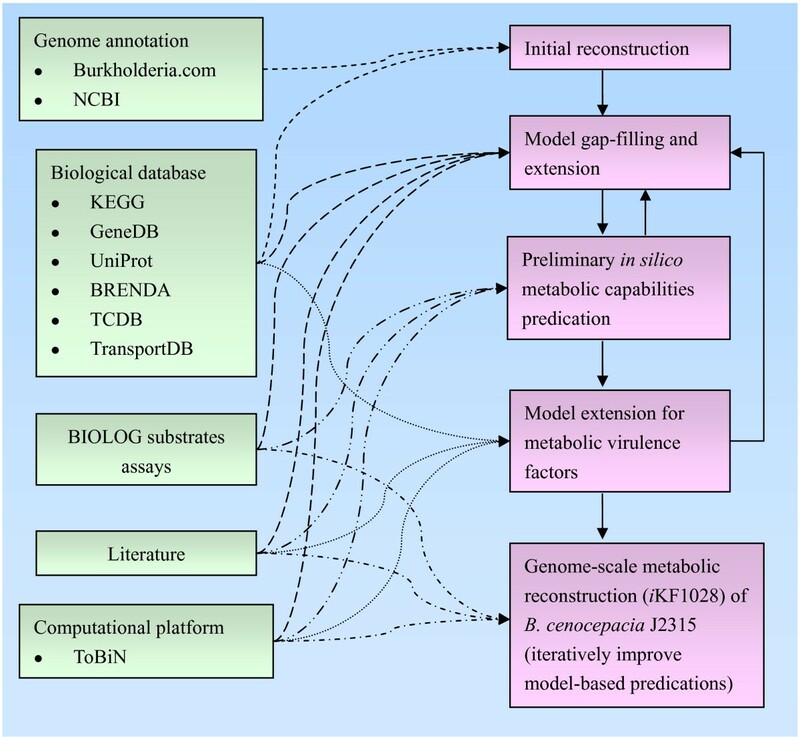 The model herein developed provides a valuable tool to explore the metabolic space of B. cenocepacia, to describe its metabolic wiring under a range of conditions, to pinpoint possible targets and to generate testable hypotheses. Taken together, our study underlined the value of the model i KF1028 as a framework to systematically study the metabolic capabilities of B. cenocepacia and its metabolic virulence factors affecting the CF community. The reconstruction process for B. cenocepacia J2315 is illustrated in Figure 5. The process followed the procedure described previously . The reconstruction was carried out on ToBiN (Toolbox for Biochemical Networks, http://www.lifewizz.com), which was first mentioned in the paper . ToBiN is a modular platform for metabolic modelling and the structural analysis of networks. It consists of a collection of open-source computational tools. Sets of reactions can be uploaded in the platform via a web interface, merged with already existing sets, and the resulting stoichiometric matrix is then processed by the server as a FBA problem. The linear solver that ToBiN used is the Clp (Coin-or linear programming), an open-source linear programming solver written in C++ and is part of the COIN-OR (Computational Infrastructure for Operations Research) project (http://www.coin-or.org). The platform works in a similar way as the COBRA toolbox with the main difference that, by being web-based, it permits users to adopt a more efficient and collaborative workflow. The process for genome-scale metabolic reconstruction of B. cenocepacia J2315. The left side indicates resources used for reconstruction, and the right side indicates the reconstruction process. Initial reconstruction started from genome annotation and other biological databases. Gap-filling was a continuous step throughout the reconstruction by probing missing reactions in a pathway which causes in silico growth infeasible, and subsequently closing these gaps by referring to the biological databases, extensive literature mining, and comparison with BIOLOG substrate utilization assays [89, 90]. This improved model was then extended by adding key metabolic virulence factors for B. cenocepacia from the literature. The process of model development and validation against experimental data was iteratively repeated until the genome-scale metabolic model was robust. An initial draft reconstruction was derived from the annotated genome of Burkholderia cenocepacia J2315 available at the Burkholderia Genome Database (http://www.burkholderia.com). To link annotated genes to proteins and proteins to reactions, biological databases such as KEGG, GeneDB, UniProt, BRENDA, Transport Classification Database (TCDB), and TransportDB were used [83–88]. Manual curations were performed to establish gene-protein-reaction (GPR) associations, which connect genetic data to reactions in the metabolic network and allow for subsequent exploration of metabolic phenotypes using genetic perturbations. After the initial reconstruction was generated, gaps in metabolic pathways necessary to produce biomass components and key virulence factors were filled by cautious literature mining, BIOLOG substrates utilization assays, and BLAST searches on homology and protein sequence similarity analyses [89, 90]. The genome annotation was refined as consequence of the gap-filling and model extension process. Flux Balance Analysis (FBA) was carried out throughout this study to explore the metabolic capabilities of i KF1028 under various environments. In addition to minimal medium, synthetic cystic fibrosis medium (SCFM) representing the physical living environment during CF infection was simulated in silico to investigate the metabolic flux distribution in a CF-like condition. The biomass composition in the genome-scale metabolic model of B. cenocepacia J2315 was adapted by selecting the well-studied biomass composition of E. coli as a template , since there's no experimental data available about the biomass composition of B. cenocepacia. However, the amount of metabolic precursors to formulate the cellular component was specific to B. cenocepacia according to previous study . Moreover, the relative fatty acid composition of the lipids required for growth was based on data specific to B. cenocepacia[63, 64, 92, 93] and listed in Table 6. Further details are provided in the supplemental material [Additional file 5]. Where S is a stoichiometric matrix containing i rows representing metabolites and j columns representing reactions, v is a vector of all reaction fluxes, vmin and vmax are imposed lower and upper bounds on flux v j respectively, and c T is a vector of coefficients for each reaction that is to be maximized. Two different living environments were simulated in silico for strain J2315: M9 minimal medium , which contains PO43-, SO42-, NH4+, H+, Fe2+, K+, Mg2+, Na+, H2O, and thiamine, with glucose or other BIOLOG substrates as sole carbon source; and synthetic CF sputum medium (SCFM)  representing the nutrient conditions inside a host-cell during CF infection. Details of the simulated SCFM composition are provided in the supplemental material [Additional file 6]. FBA can be used to interpret genetic modification, such as gene deletion and enzyme inhibition, and subsequently make comprehensive in silico predictions on gene and enzyme essentiality . To assess the essentiality of a gene, its GPR is checked for a unique relation with the associated reaction(s). If the gene is necessary to the reaction, the reaction flux will be constrained to zero and a solution for the maximal growth yield is searched. The deleted gene is predicated to be essential if, as consequence of that added constraint, the value of the objective function (growth yield) changes to zero. The deletion of every gene accounted in the model was simulated for growth on minimal medium with glucose as sole carbon source, and on SCFM. Similarly, an enzyme is considered essential if, by constraining to zero the flux on every associated reaction that has no alternative means of catalysis, the value for the growth yield changes to zero. The essentiality of every enzyme accounted in the model was analysed for growth on SCFM. Kechi Fang, Hansheng Zhao contributed equally to this work. We acknowledge funding from the European Union (Projects PROBACTYS: Grant No. 29104 and MICROME: No. 222886), the National Basic Research Program of China (973 Program) (Grant No. 2011CBA00802) from the Ministry of Science and Technology of the People's Republic of China, the Project for Young Scientists Fund, Institute of Psychology, Chinese Academy of Sciences (Grant No. O9CX115011), and Portuguese Fundação para a Ciência e Tecnologia (Project METAGUT; Grant No. ERA-PTG/SAU/0003/2008). KCF, HSZ, SCY, SHC, and KLZ carried out the reconstruction of Burkholderia cenocepacia J2315. KCF designed the study and performed the analysis. KCF and CMCL arranged the BIOLOG substrate utilization analysis. JW and VMDS supervised the research. KCF, CMCL, VMDS, and JW drafted the manuscript. GP provided technical support for the reconstruction of B. cenocepacia J2315 in ToBiN. MG was involved in the early stage of the development of i KF1028 in ToBiN. All authors read and approved the final manuscript.